As a 529 plan account owner, you've taken a big step by starting to save for college. But having an account is just the beginning. You should also have a college savings strategy. Families who have a plan to pay for college save 46% more than families without a plan, according to Sallie Mae's "How America Saves for College 2015" study (conducted by Ipsos Public Affairs). The first step in creating a strategy is to know the total amount you plan to save. How do you decide? Keep in mind that you may not be able to save enough to cover 100% of college expenses—in fact, most people don't. Another Sallie Mae/Ipsos study, "How America Pays for College 2015," reports that families (parents and students) typically cover about 43% of total college costs through current income and savings. Once you've decided on the percentage of expense you'd like to cover, use Vanguard's college savings planner to figure out how much you'll need to save each month or year. 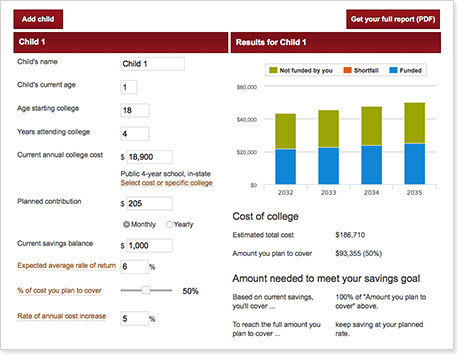 The planner uses 50% of expenses as the default (which you can adjust) and takes into account your child's age, the type of school he or she might attend, and the amount you've already saved. Hypothetically, let's say your son is 1 and you've saved $1,000 in his 529 plan account. You'd need to save a lot more over the next 17 years to reach the $186,710 that four years at an in-state, public college could cost in 2032. But what if you aim to save just 50% of that total cost? $93,355 is still a big number, but it's not impossible. Select Contribute from the right-hand navigation. Under How would you like to contribute? choose Electronically through your bank account. Select the appropriate beneficiary's account. Enter the dollar amount of your contribution. Under Is this a one-time or recurring contribution? choose Recurring (also known as an Automatic Investment Plan) and follow the instructions. Whether or not you decide to set up recurring contributions, having some kind of plan to save regularly is critical to growing your 529 plan account balance and reaching your savings goal.